With the Fed all but certain to raise interest rates later this month (for the first time since June 29, 2006), the talk around town is all about the strengthening USD. As a holder of lots of USD, this is of course overwhelmingly good news in my eyes. According to Janet Yellen, the U.S. economy “has recovered substantially since the great recession,” and is FINALLY ready for a rate hike and the tightening of monetary policy. When I look around me (locally), high-tech companies are consolidating left and right (just look at all the recent M&A activity) and many employees have gotten the ax. My former co-workers and even some close friends are all shaking in their boots right now, afraid of what may be in store for them later… As such, they are all taking a heavily defensive posture in spite of the mainstream media’s constant headlines of “low unemployment rate” and 4 decade low jobless claims. Whereas the rest of the world is hell-bent on more money printing and stimulus (Europe, Japan, etc. ), it would seem counter-intuitive that the US, instead, is ready to do the complete opposite. As if multinational companies here are just dying for an even stronger dollar (sarcasm)… after releasing a slew of horrendous earnings reports this past quarter. Look at the growing declining revenues; that’s what tells the TRUE story. As an investor, there’s nothing to complain about! Just go along with the Fed and embrace the opportunities that a strong dollar offer up to you. This means your dollar goes a hell of a lot farther and you can buy up more and more assets! What am I doing myself? I’m going to continue to use the exceptionally strong (and growing more potent by the day) USD to exploit weaknesses in other currencies. 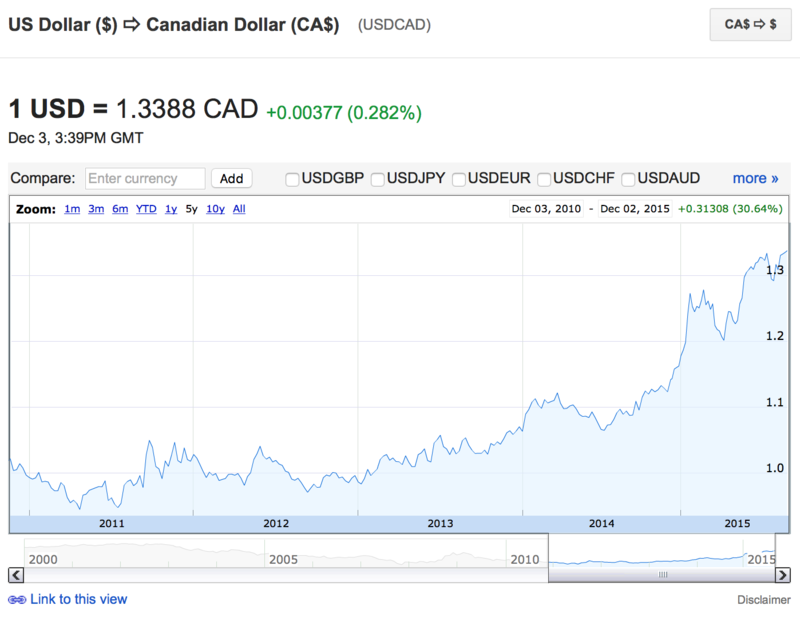 The USD is up over 30% in the last 5 years relative to the CAD and AUD. And as readers well know, I’m someone who believes very strongly in market cycles. What goes up must come back down… eventually. In a currency war, it’s a race to the bottom… We had our turn in 2009 and 2010 when the Fed unleashed the first few rounds of Quantitive Easing (QE). It worked so well, now everyone else around the globe wants their turn! Please Note: I am NOT providing any investment advice or recommendations. I am merely sharing with readers what I am doing with my own capital. There are always RISKS involved. As always, you need to perform your own due diligence and ONLY take actions that you are comfortable with. Yes, the USD will probably continue to strengthen over the next 6-18 months (let’s wait and see how many successive rate hikes they’ll be manage to pull off before we give the Fed too much credit)… But it’s already reached levels where I am comfortable with performing currency swaps into much cheaper alternatives. I’m going to take the approach to dollar cost average (DCA) over the next year, especially on occasions when the USD is particularly strong. What am I planning on doing with the CAD, or AUD? Simple, I’m going to keep on buying commodities (mining stocks) on the TSX, TSX-V, and ASX (no holdings yet)! This only further enhances my objective to BUY LOW! I already believe that gold and silver mining stocks are trading at record low valuations, down over 80% to 90% from their 2011 peaks… Even in USD, I’m a strong buyer. 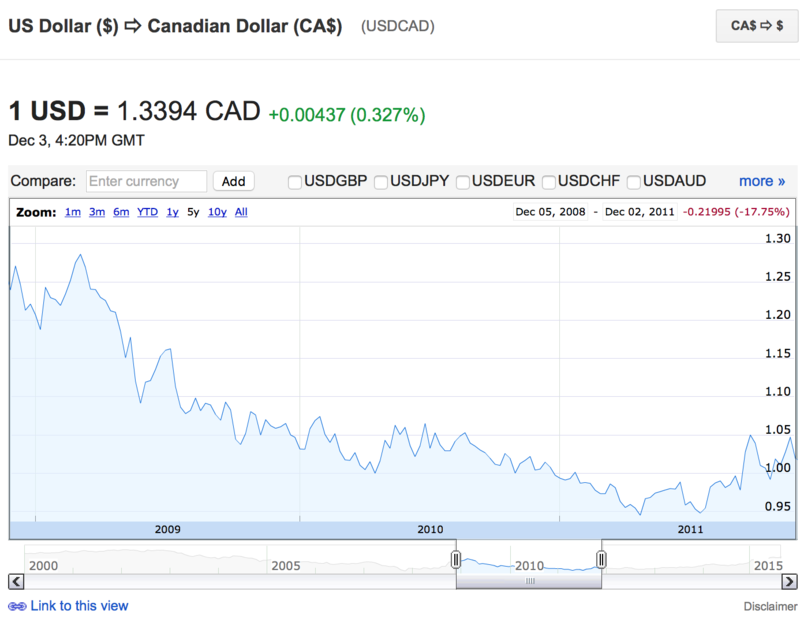 The fact that I can also trade my USD for CAD or AUD for a 30% gain (relative to 5 years ago) is just icing on the cake! I will take that trade every day of the week (and I essentially am)! Although consumers and investors/speculators LOVE deflation, central banks around the world HATE deflation… They can’t exist in a deflationary environment for long periods of time. What’s the easiest way to service too much debt (like ALL nations across the globe have)? 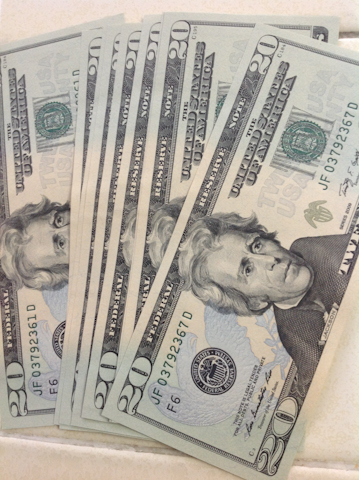 Inflate it away… Print more money! How do you stimulate a slowing economy? Devalue your currency to try and boost exports (and to some degree tourism)! Both scenarios will no doubt lead to an eventual debasement of the currency… And don’t worry, inflation will always get another swing at the plate; it’s the central banks’ favorite solution! Precious metals are the ultimate inflation hedge and protection against currency debasement… and they will have their time in the sun again… To some degree they already are SHINING BRIGHT. So I’m going to continue to focus on gold and silver mining stocks this time around. But I won’t plan on converting these currencies (CAD/AUD) back to USD until the USD weakens substantially again at some point in the future (which it will). This will require some patience, of course, but for deep value discounts, I’ve got plenty of that! As it pertains to yen or euros? Darn, I only wish I had booked vacations to Japan and Italy NOW instead of in late 2014!!! 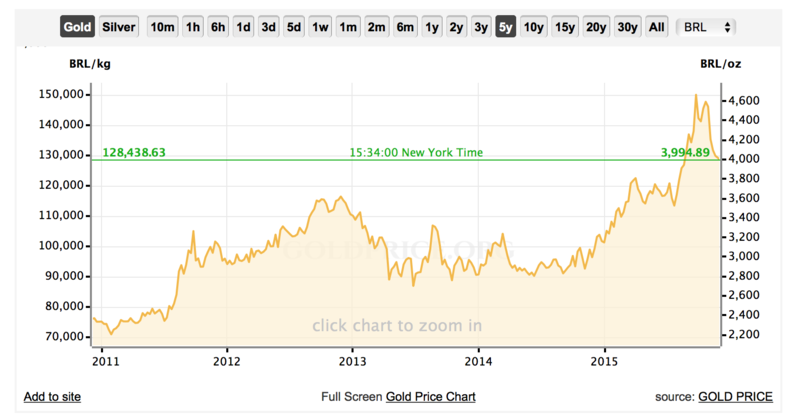 Oh well, you can’t win them all… But I am loving the currency arbitrage opportunities that are present today. Keep posting daily articles, your doing a great job. Thanks! I’ll do my best to post whenever I can. 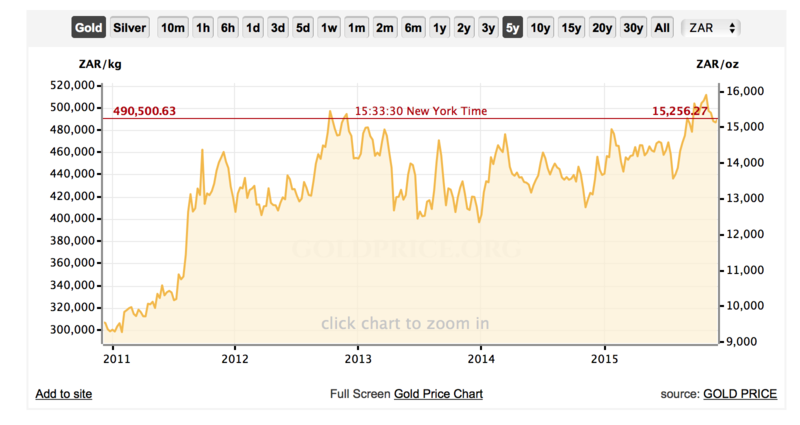 I’m curious why you would swap USD for CAD/AUD just to then purchase gold with it? I can’t wrap my mind around the reason for making that intermediate step. Regarding the rate hike I think the Fed is backed into a corner. Given where the economy is at we shouldn’t be on 0% but the USD is so strong already tightening money supply while the world loosens is a recipe for more strength to the USD. And it’s not like the ECB or China is probably going to stop their loosening anytime soon because both areas are still languishing. But I understand the need to raise the rates because 1) 0.25% should do nothing to the economy to slow it down, that’s still essentially 0% and 2) they need some kind of lever to pull when the next recession does show up without going to negative interest rates. The 0.25% might actually lead to more debt being taken on since companies know that the ZIRP is finally over but the problem, much like the last 6 years, is getting the companies to actually use that debt to grow the companies instead of just loading up the balance sheet or retiring shares. I’m swapping USD for CAD/AUD to buy gold mining stocks outside of the NYSE, on the TSX, TSX-V, and ASX, which are the premiere stock exchanges for natural resources. When buying foreign equities I’m doing so in that country’s denominated currency, not USD. In regards to a rate hike, I agree with you… 0% for perpetuity will only encourage more malinvestments and for companies/consumers to take on even more debt or free money… Retirees and pensioners on fixed income are the ones who really get punished… They are being forced into riskier assets in search of yield. But I really can’t see rates ever normalizing again (+25 basis points is NOT normalizing! )… There’s too much debt in the system now. The debt load would be insurmountable… If it was possible to normalize rates, we probably would have already started the process by now… I think this upcoming rate hike has more to do with Fed “credibility” than a robust, recovering economy. As investors/speculators we just want to do our best to position ourselves so that we can prosper and not get slaughtered along the way. Have you had to file taxes yet for your foreign holdings? NIGHTMARE! Rental properties are a pain too, but for a high enough reward it’s worth the pain. Great job on your posts! I really enjoy reading your perspectives and strategies! I’m a fellow young electrical engineer in the semiconductor industry, so many of the job frustrations you have expressed previously ring true with me. And current job uncertainties with acquisitions…I am right in the midst of it. I’m wondering about ‘converting currencies’… Can you elaborate more on what that entails? How do we buy stocks and commodities on foreign exchanges? Do we need to convert our USD to foreign currency first through a bank before we are able to invest? And are there concerns with taxes? All of my experiences have been soley in the US markets. First, the obligatory you shouldn’t take hot stock tips from the internet. Buy EWC and/or EWA which are ETFs that index the stock markets of those respective countries. It is even commission free to do so at TD Ameritrade. The ETFs are priced in USD so they go up and down based on both the exchange rate and performance of the TSX/ASX. Fidelity, Schwab, Scottrade are some popular online brokerage options available… I use an online broker myself, not a full service one (which is more expensive but you get more resources/guidance). No, you can convert USD into foreign currencies directly through the online/full service broker. In my case, I do it directly online prior to placing a trade. In regards to taxes, it would be best to consultant with a tax professional for more exact details. I kind of want to piggy bank on what AC is saying. Say a person knows absolutely nothing about converting currency and then using that converted currently to buy in these other trading places. How do you do that? Through your broker like vanguard or something? I don’t think Vanguard offers such a service, but I am aware that Schwab, Scottrade and Fidelity do. Once you get that setup, you can sell/buy currencies using their online platform (same as any other online broker). <$100K	1.00% $100K - $249K	0.75% $250K - $499K	0.50% $500K - $999K	0.30% $1M+	0.20% Once the funds are converted into the local currencies, you can buy directly on a foreign exchange (e.g. TSX, ASX, etc.) Hope that helps! We are completely aligned on this. 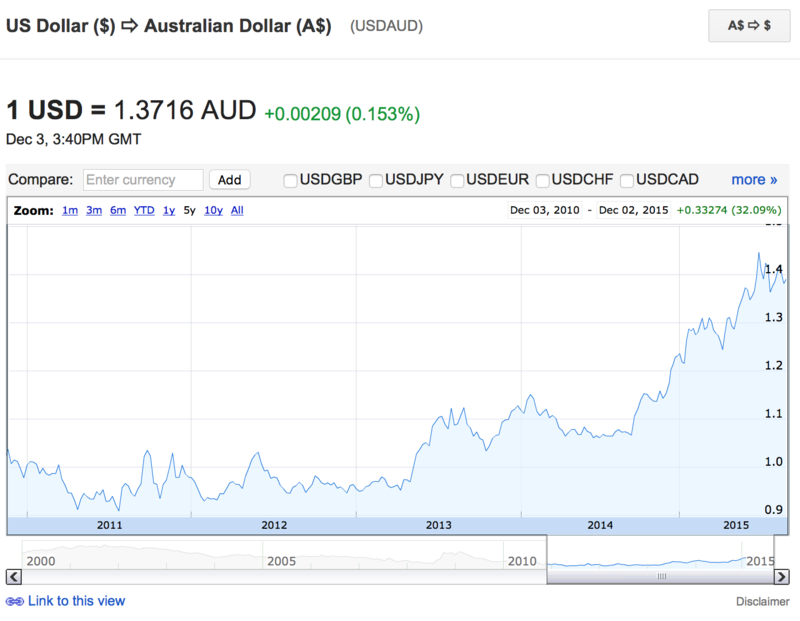 I started buying the Australian Index in 5/2013 and the Canadian Index in 2/2014. At the time, I was interested in international diversification in ‘familiar’ economies, plus the ASX dividends were ~5% compared to the S&P’s measly 2%. I’ve been buying into the downturn, but there is definitely long term value here. When the US Schiller PE is 26, it is nice to buy into something on sale backed by good old fashioned oil, minerals, and gold. Yup, we are on exactly the same page there. When I’m doing currency swaps, I am only interested in sticking to first world countries such as Canada and Australia. Like you mentioned, those countries are especially natural resources intensive… That’s what drives their local economies. Because they will ALWAYS come crashing down HARD! That, and commodities sure make for some lousy Buy and Hold Forever investments (this includes oil)… I now much prefer to only trade them (accumulate at market bottoms and start unloading when they either revert back to the mean or overshoot and set new highs). Stick to the bottom, or in this case historic low territory, and you should do a lot better. Definitely, I also see much more value in commodities than a general market index. I live in Canada. If you know any ways I can make the low dollar work for me that would be great. Everything American looks expensive. That’s a tough one… Well, I do see a lot of Canadians trading in their dollars to purchase American stocks… and I’m not really sure why. Right now, I’m seeing the most value in Canadian stocks trading on the TSX and TSX-V… If I was Canadian, I would be very content with playing in the sandbox in my own backyard. But I can understand how the weakened Canadian dollar would make investing difficult… Which is why I think U.S. investors should thank their lucky stars for this wonderful opportunity they have right now. These current aberrations do not last indefinitely. Do you really do currency swaps and hold cash in foreign currencies? With my broker i have the option to buy foreign securities and they convert my money into whichever currency the asset is denominated in, and then buys it using todays exchange rate. After that my gain or loss is calculated by daily updating exchange rates as well as the asset price in local currency for the stock exchange where it’s brokered. No, you don’t have to trade directly on a foreign exchange… You can purchase many of the same stocks OTC (over the counter). For instance, I own Ivanhoe Mines (IVPAF) which is a Canadian miner, but I bought it in US dollars with my retirement account. 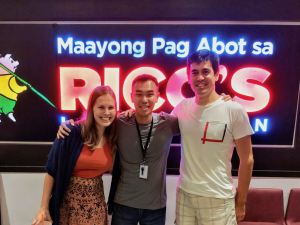 Because that stock is so thinly traded, I actually had my broker go onto the TSX and covert my USD into CAD to make the purchase directly on the Canadian exchange… On the way out, they will convert the funds back into USD and you’ll hold shares of IVPAF. There are some fees for this, but it saves you the hassle of needing to setup a foreign account if you don’t want to do that. On the Canadian exchange, the same stock would trade under the ticker IVN.TO. In general, my own preference is to buy Canadian miners that are not listed on the NYSE directly on the TSX or TSX-V using Canadian dollars instead of utilizing the OTC equivalent…to take advantage of the USD strength. If a company, such as Klondex Mines (KLDX/KDX.TO) is dual listed, however, I’ll simply buy on the NYSE to save on commission costs and exchange fees. Hmmm interesting idea, because the US dollar is so strong right now, I’m avoiding exchanging CAN to US. I can see how you can use the strong dollar to benefit you.